Reaching financial independence, the point where your investments cover your lifestyle and then some, is the ultimate goal if you want to retire comfortably. And in a perfect world, you would like that to happen sooner rather than later. I have good news for you today: it is absolutely feasible if you put in the right amount of effort and dedication. Yes, even on a small budget. Take a look at the CBB household for instance. They’re worth over $800,000 and on track to pass the million dollar mark by this time next year. And as a faithful reader, you know Mr.CBB is just your regular guy, who started a bit above minimum wage 8 years ago. He has worked two jobs for years and carefully budgeting every cent to make sure his family is safe financially. There you have two of the three steps to financial independence: earning as much as you can, and spending as little as you can. The third part is where you can actually accelerate the process quite a bit: find the best investing returns you can and make your money work for you. How much do you even need to retire? You won’t see the point of earning as much as possible, while keeping your spending in check, unless you picture the end goal. Retirement. Are your kids still in college and in need of your support? How about your house, would you downsize to save money? It is pretty hard to come up with an accurate retirement dollar figure. While some expenses are likely to stay the same, others will increase, and some will decrease or vanish. Hopefully, by the time you are ready to retire, your kids will be independent, your house will be paid off and you won’t have a mortgage, and if you move to a smaller house, you will be able to reduce your utility bills and property taxes as well. No more work related expenses such as commuting or buying expensive suits. On the other hand, with retirement come different expenses, such as health related costs, maybe the need to pay for terminal care in the end, or simply leisure costs like a golf membership or an annual cruise. You may need someone to clean your house or do the yard work. And so on. One thing is sure, you will need money, and probably will live longer than you think. So let’s try to prepare so we don’t have to worry too much in old age. You need AS MUCH AS POSSIBLE to retire. Saving $1,000,000 will only yield you $40,000 per year, if we use a safe withdrawal rate of 4%. With inflation, that will barely allow you to live a modest lifestyle. And a million dollar is usually a long stretch for many households. Over at Freedom 35, my friend Kevin has researched the numbers on the average Canadian net worth by region and family status. The average Canadian net worth in 2015 per adult was $248,300. That of British Columbia in 2013 per household was $591,000, and $710,100 in Vancouver. While these numbers are good, if you take out the value of a house, that doesn’t leave much to live off in retirement. So how do you make more money? Investing returns can make or break your financial future. At the moment, high yield savings accounts offer abysmal rates, to the tune of 0.5% or less. Boo! We need more than that, if only to keep up with inflation! One quick way to get better investing returns is simply by paying off your mortgage early. If your mortgage rate is at 3%+ that is a safe way to save on interest. But in general, higher returns are correlated to a higher level of risk. We could all have become billionaires if we had bought Bitcoins early enough, but for every Bitcoin story, there are thousands of projects you don’t even hear about, because they fail before they even become popular. And people lose money on them every day. That’s the last thing you want. Which is why, when it comes to investing, I usually stick to boring index funds. They don’t require you to research a specific stock for hours, before you decide to invest or not. They amalgamate an array of stocks and shares that are diversified enough to spread your risk. For example, an S&P500 index will follow the market caps of 500 big US companies listed in the New York Stock Exchange. The FTSE Canada Index works the same way. Most providers will allow you to start investing with little money, $500 or less. But the best part about indexes are the returns they offer. From 1980 to 2016, the S&P500 has returned 8% annually on average. And over 11% if you reinvested the dividends. Put that in your Registered Retirement Savings Plan or your stocks TFSA, and watch your money grow. You can accelerate wealth building with compound interest, here’s how. Because investing returns have such an impact on your wealth building, you want as little overhead as possible. Pick a low-cost broker, and take full advantage of tax-free and tax deferred plans. Let’s have a look at how much difference 1% in investing returns can make. If I invest $100 per month from age 25 to 60 at 8%, I will have $232,392 saved. If I invest $100 per month from age 25 to 60 at 7%, I will have $182,015. A whopping $50,000 difference! Now what if we want to become millionaires? If I invest $500 per month at 8%, I will become a millionaire in 34 years. If I invest $500 per month at 7%, I will become a millionaire in 37 years. Who wants to keep working three years longer than necessary? Compound interest drastically accelerates wealth building. And the higher the interest, the faster you will be financially independent and able to retire. Because you have time on your side, you can afford to take more risks than people nearing retirement age. In spite of ups and downs in the markets you can generally over the long-term get much higher investing returns than with basic savings accounts. Have you started investing yet? What is holding you back? Have you broken your retirement goal into monthly savings goals? Big thanks today to my friend Pauline for this wonderful post. Post Contribution: This is a guest post from Pauline of InvestmentZen.com. 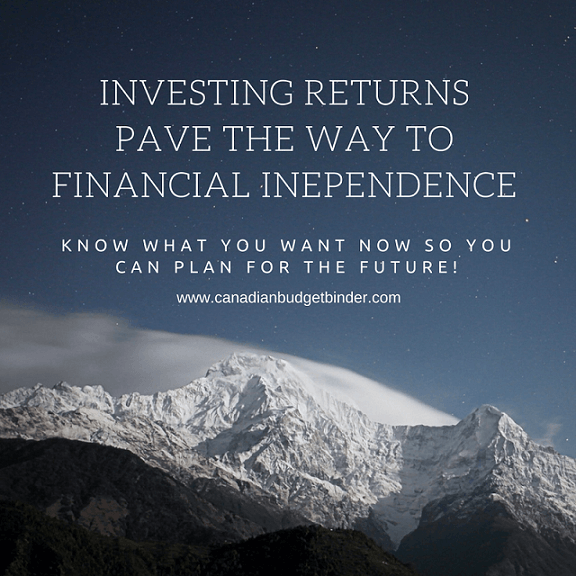 Pauline has been a personal finance blogger for years, and tries to explain in simple terms that investing and reaching your financial goals is easier than you think. When not geeking over money, you can find her traveling the world on a motorcycle, or fixing up a little house down in Guatemala. All have to think about the future pension investment planning.We started this about two years before with the scheme of best Personal Loans. So all who needed can contact us. I started investing in 2001 I had done other stuff first like treasury bills. Ended up stopping those and while I didn’t hold them as long as I would have to liked I used them to pay for a rebuilt engine for my truck. It was helpful. Once I found online trading account the decision. Was easy to start investing. Also in 2001 the military started a TSP so I contributed to that also. Online trading has definitely made things easier for the small investor. It’s good to hear that Canadians on average are doing better than folks in the US. I worry about us down-here. We have not be investing other than pension plans at work. What is your opinion on them and do you think they’ll be around for the long haul. On a side note: it’s not that we don’t want to invest, it’s just that we’re focussed on getting our debt paid off. Paying off debt is a guaranteed return (that of your loan or credit card, and usually pretty high), so it makes a lot of sense to pay off your debt first rather than invest. However an even higher return is taking advantage of your company match which you seem to be doing. Pensions plans should be staying around, what is not guaranteed is your company will keep offering matches or incentives.